Are you still hanging onto Windows XP? If your business is like many across the country, Windows XP desktop computers are still widely used by the majority of your staff. Windows XP is perhaps Microsoft’s greatest success story. This legendary operating system survived the Windows Vista years and is still going strong even though Windows 7 has been out for a while and now Windows 8 is gaining in popularity. However, all good things must come to an end and Windows XP’s end is near. On April 8, 2014 the plug will be pulled once and for all on Windows XP leaving businesses around the world with a decision to make. They have less than 500 days to accept the risks associated with not moving to Windows 7 or Windows 8 or making the jump to these newer, highly reliable and more secure operating systems. Windows XP was never known for its high level of security. After all, it was built on technology that is approximately 10 years old and the threat landscape online and in our corporate networks has drastically changed. 10 years ago when Windows XP became widely adopted, business never leveraged the Internet the way we do today, wireless networking was in its infancy and security threats were delivered via email-borne virus attacks. A lot has changed since the early 2000’s and so should your business. Not upgrading from Windows XP will represent a significant security risk for your business. In an article written by ZDNet journalist Jack Schofield, he calls out what could happen if a security breach due to a business not upgrading away from Windows XP happened to a corporation or even a small business. Companies across the country could be in for a rocky ride if a security breach hit their business because of their continued use of aging technology and their “undue care and attention” to their computer technology. Schofield also predicts that some organizations could end up being sued. He expect lawyers who work in the IT scene could realize potential profits from organizations who have not taken the required steps to ensure data, personal information and other confidential items are properly safeguarded. Not upgrading away from Windows XP and not heeding the notices could put your business at risk. In the United Kingdom, there is a mandatory requirement to secure all data under the 7th principle of the Data Protection Act. The act necessitates some kind of risk assessment. “Good luck telling a judge that your security was based on using an insecure and unsupported operating system,” Schofield says. Are you ready to upgrade now? Our team of trained Microsoft professionals is ready to help you upgrade to Windows 7 or even Windows 8. With only 500 days and less to go until Microsoft stops supporting Windows XP, the time is now to take action. Call us today to book a complimentary review of your upgrade options. 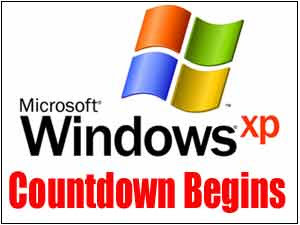 If you would like to keep tabs on the days remaining, UK IT company Camwood has provided a Countdown Clock for XP, we hope you never need it.